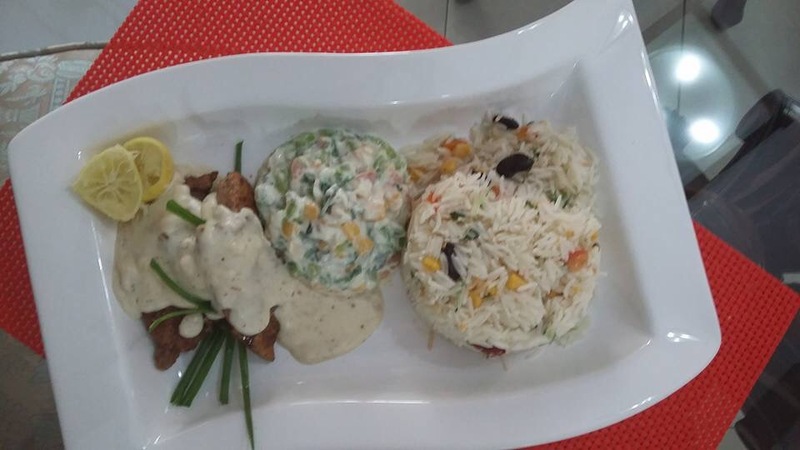 Today I am posting a Guest post winner recipe for Ramadan meals which has been sent by my sweet blog reader Rabia Rasheed….It is Fiesta lime rice , american corn salad with chicken steaks n white sauce on top . 1½ cups cooked long grain rice¾ cup canned black beans, rinsed and heated¾ cup cooked corn, heated1 large tomato, diced1 large scallion, diced fine2-4 Tbsp chopped cilantro (to your liking)1 Tbsp fresh squeezed lime juiceSalt to taste. In a large bowl, combine hot rice, heated corn, heated beans, tomato, scallion, cilantro, lime juice and salt if needed. Toss and serve. Mix all ingredients n serve. Rosemarry leaves chopped 1/2 tsp. Mix all ingredients with chicken marinate an hour then grill chicken from both sides n serve. Heat butter then add flour n keep spinning untill smell of flour comes then remove form heat let it little cool then add milk with egg beater or whisk untill better becomes smooth then put on heat n add cheese n whisk till it mix then pour the better on steaks n serve.